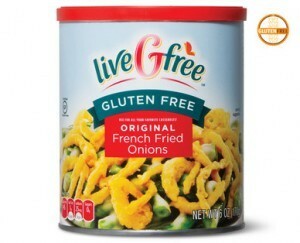 Just in time for green bean casserole season, ALDI is selling gluten-free French fried onions under their liveGfree brand. French fried onion rings in the traditional Thanksgiving and Christmas green bean casserole recipe have always been problematic for those who are gluten free. There are many ways to make them yourself, but this is the first ready-made product we are aware of. A gluten-free condensed cream of mushroom soup was launched a few years ago by Pacific Naturals, giving gluten-free cooks a convenient option for the other gluten-containing ingredient in the beloved recipe. Bargain shoppers, take note: The French fried onion rings are on sale this week. ALDI’s liveGfree gluten-free stuffing mix is also on sale, so it might be worth your while to start your Thanksgiving shopping early. Aldi’s last year launched gluten-free products under it’s store brand name, liveGfree. They typically have a lower price than most specialty gluten-free brands. While we are happy to announced the addition of the onion rings, we suspect the liveGfree cheesecake is no longer available as we’ve not seen it in the Aldi’s freezer case for some time. The company did say when it launched the brand that some products would be available in limited quantities. If you’ve seen the cheesecake in your Aldi’s, let us know. We’d be happy to hear it is still around in some locations. Michael Savett, who blogs at glutenfreephilly.com, was the first to report news of the onion rings on Twitter and Instagram. We’ve said it before – he’s a great product sleuth.